Forget about coding your websites from scratch. Rather than forcing a complex and obscure templating system upon you, Dragify takes a different approach by letting you build websites by using blocks. 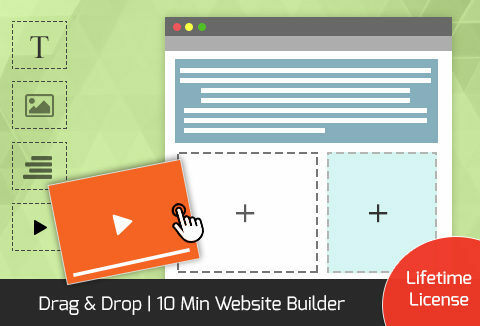 With Dragify you can create stunning websites for yourself, your business, or for others. Hi, Sounds like a good package. Please explain more on 10 Site CMS – have 10 website projects active, will one be limited to creating 10 websites? Also went to their website and this was not clear and I could not find terms and conditions. Basically it allows for 10 active ‘projects’, you can create as many sites as you wish, but only you can have 10 ‘stored’ if you want to put it that way. Once you create a site you can export it to your computer or upload to your web server. If you don’t want to ‘save’ it in Dragify then it doesn’t count as one of the 10. Hi all, the 10 Site CMS/Active projects means that your account will allow you to have up to 10 sites under your account. This system allows you to build and save and have up t0 10. Or you can build and then export the site and not save them under your account. So you can create unlimited sites but you can only have up to 10 saved unless you upgrade to the Pro plan. Ok, so you can export it. But can you import it back in Dragify later on and continue from there?